Zombies are less polite than vampires when it comes to making you one of the un-dead. Vampires require your permission to enter your house, so don’t worry about them. You need our tips on barricading your home sufficiently against the relentless onslaught of hungry reanimated corpses after the zombie apocalypse. First things first, you need to know what you’re dealing with. Zombies or ‘walkers’ are slow, rambling, sheep-like creatures with no real ‘life’ plan, other than to eat the living when the opportunity presents itself. They are, however, persistent and once one realizes where you are, the others will follow. Once they get hold of you, fighting them off is a struggle. Make sure that you don’t get to that point by safeguarding your house efficiently now. 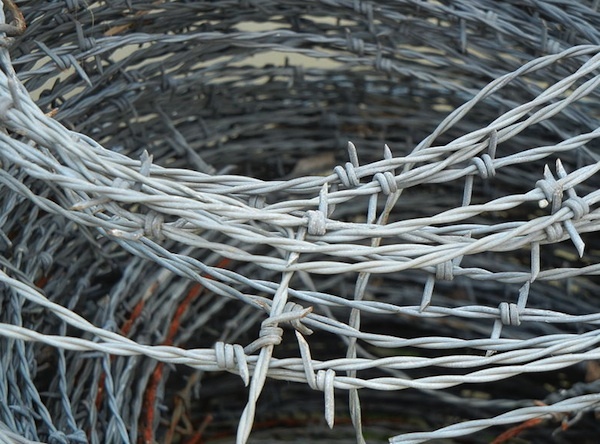 Let’s start with the perimeter – get a fast-growing and impenetrable shrub hedge, with wire fencing contained within it. Keep handy a good length of barbed wire in the shed to throw over this when the apocalypse breaks out, as zombies will get themselves tangled. Make sure to clear them periodically so that they don’t provide a ladder for others. You might want to store a few fixed man-traps near the lawn to fling on to slow walkers down. Ensure you go out and bash their heads in at a safe moment so they don’t attract their friends. On the house itself, you’ll need to keep strong planks of wood ready to board up the windows from the outside. This is because zombies press on the windows and don’t have the wherewithal to rip them off. Obviously you’ll have to wait to do any constructing, the neighbors might talk otherwise! Until the time is right keep bookcases and other large heavy furniture by windows, ready to create a second barricade. This is especially important on the ground floor. An axe is a great investment for any would-be zombie fighter. It can be used for caving in corpse craniums and for chopping up furniture to replace any broken barricades. This brings us neatly to weaponry. You need to protect yourself at all times, so stock up on heavy, swing-able bladed objects. Sawed-off garden hoes are ideal, as are spades, shovels, fire pokers and pick-axes. Place one near to every entry point in the house as soon as possible. To stop visitors thinking you odd for having gardening implements in the house, perhaps just move the shed closer to the house for the time being. If you have access to a shotgun (hopefully you’re a farmer) then keep it well maintained and ammunition stocked up. Once you’re all fortified you ought to stockpile supplies. First aid kits will need padding out to cope with more serious injuries. You won’t be able to ring for an ambulance. Food-wise you’ll need lots of tinned food. Keep a variety of food types, with lots of protein and vegetables to keep your strength up. You might consider using a roof terrace or window boxes to grow vegetables in. The water supply will quickly dry up after the apocalypse so stash away some bottled water, even keep old bottles and start siphoning off tap water. It would be remiss of us not to advise you on how to survive after the zombies, who are grazing beasts, have used up the local resources (ok, eaten everyone else) and moved on. If you’re lucky enough to own a garage or workshop, buy a 4×4 and start tinkering away in secret – bolster the vehicle with corrugated iron, put a metal mesh over the windows and spray it black to become less conspicuous when you do make your getaway. Get a bicycle on the roof rack. Thanks to our guests Distinctive Doors for this handy guide. For the stylish undead repelling connoisseur, they recommend their own windowless sturdy oak doors. What methods of preparation do you recommend? Is hiding in the attic still viable? Wow, this is quite the post. Pretty funny. I do need some new doors, glad to hear these are Zombie resistant. This is too funny although I was watching a show last night and this guy was saying how due to the nature of the human jaw, zombies could not break through a skull to eat brains. Yeah, I seriously saw this on tv last night. LOL I think we may be doomed if the zombie apocalypse comes anytime soon. Guess I better start using these tips to fortify our home. Ha! This is excellent advice. Thankyou. My husband has a whole plan if a zombie apocalypse ever happens. If we can follow through with it, who knows, but at least we have a plan. Watching The Walking Dead like crazy I can be the first to tell you I would be scared out of my mind! 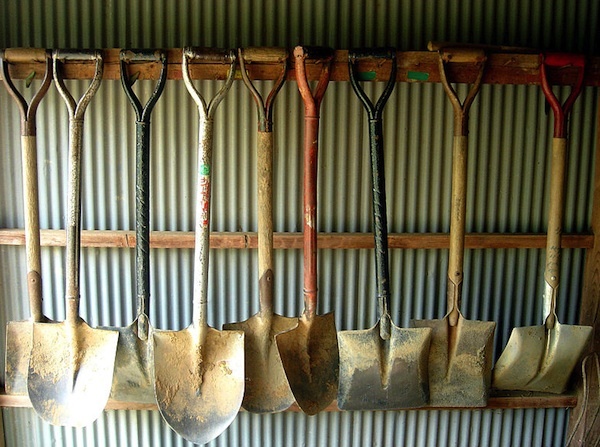 I love the photo of the shovels. Oh dear, I am not prepared at all. Looks like I’ve got some work to do. Lol. My sister-in-law actually believes there’s going to be a zombie apocalypse. what in the world is a zombie apocalypse? I swear some people have ridiculous imaginations. Nice article. A great hedge to grow would be Osage orange because it’s thorny anyway. Farmers used to use them for cattle and sheep boundaries. You usually see them growing as small trees, but they can be trained to form a hedge. A shotgun would be useful, but only if you know how to use it, and only as a last resort. Shotguns are loud, which would just attract more zombies. A .22 rifle would be a lot better because they’re more quiet, smaller ammo means you can store and carry more. For stealth, get a crossbow and A LOT of bolts. Yes, you can retrieve the bolts for reuse, but they do eventually wear out and break. Now, do I really believe the dead will rise and try to eat humanity? No. But if you’re prepared for zombies, you’re probably prepared for something not as devastating. And remember the rage virus in 28 Days Later? Who knows what kind of nasty bugs are going to mutate.